Giuseppe Cardegna first appears in Painesville, Lake County, Ohio in 1904. When Giuseppe immigrated to the United States Painesville was his destination. 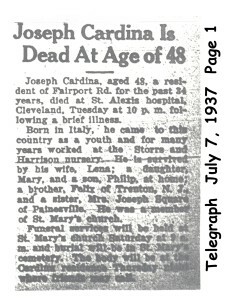 In America, Giuseppe Cardegna was known as Joseph Cardina. Giuseppe Cardegna, son of Filippo Cardegna and Maria Giovanna Mainella, was born on May 1, 1889, at Frosolone, Isernia Province, Molise, Italy. He married Maddalena Fasciano, daughter of Pietro Fasciano and Antonia Iammarino, on July 5, 1912 at Cleveland, Cuyahoga County, Ohio. Maddalena Fasciano was born at Ripalimosani, Campobasso Province, Molise, Italy. Giuseppe died on July 6, 1937, at St. Alexis Hospital, Cleveland, Cuyahoga County, Ohio, at age 48, of a coronary thrombosis. His body was interred at St. Mary Cemetery at Painesville Township, Lake County, Ohio. Giuseppe Cardegna immigrated to the United States on March 18, 1904, at age 14. He was travelling to Painesville Township, Lake County, Ohio. Giuseppe was joining his uncle, Nicandro Cardegna, in Painesville. He arrived in the United States at the Port of New York City aboard the ship SS Prinz Adalbert. Giuseppe Cardegna became a citizen of the United States in 1912. Giuseppe resided at Painesville Township, Lake County, Ohio, when he was naturalized. Giuseppe Cardegna registered for the World War I Draft on June 5, 1917. He was living at Painesville Township, Lake County, Ohio. Giuseppe was employed by the Storrs and Harrisons Nursery Company. Giuseppe Cardegna was enumerated for the 1920 Census of the United States, on January 9, 1920, living at Fairport-Nursery Road, Painesville Township, Lake County, Ohio, as a head of household. He was enumerated as Joseph Cardeno. Giuseppe Cardegna was enumerated for the 1930 Census of the United States, on April 15, 1930, living at Fairport Road, Painesville Township, Lake County, Ohio, as a head of household. 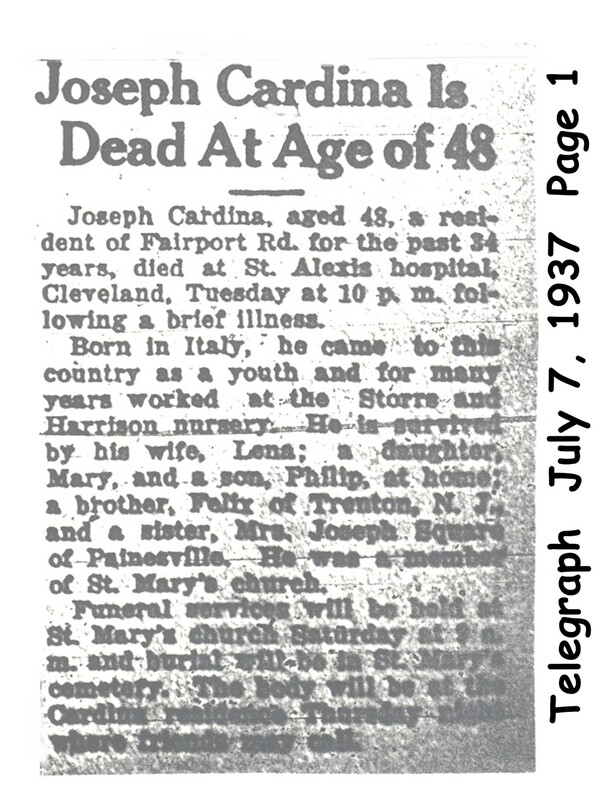 He was enumerated as Joe Cardina. At the time of death, Giuseppe resided at Fairport-Nursery Road, Painesville Township, Lake County, Ohio. Giuseppe was primarily employed as a laborer for the Storrs and Harrison Nursery Company. 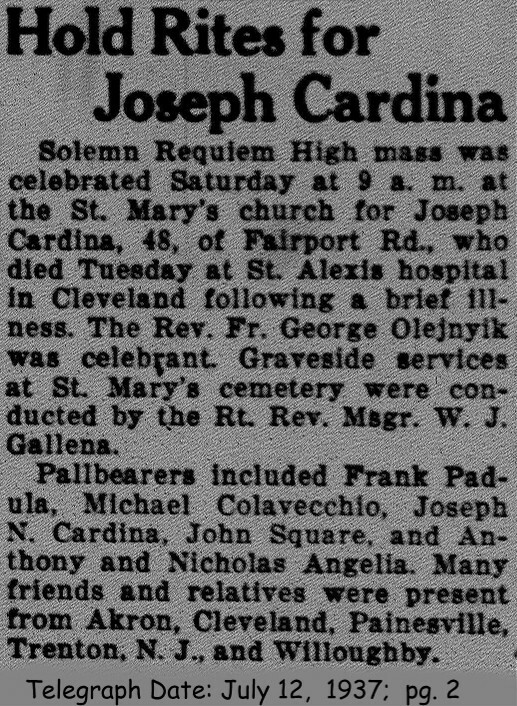 Giuseppe’s father, Filippo Cardegna immigrated to Painesville around 1900. 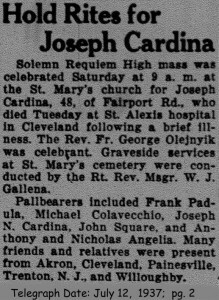 He also had three siblings who migrated to Painesville: Michele Cardegna in 1903, Anna Cardegna in 1906, and Felice Cardegna in 1910. 1. Philip Cardina was born on June 29, 1914, at Cleveland, Cuyahoga County, Ohio. He married Nancy M. Venditti, daughter of Donato Venditti and Concetta Borrelli, on September 27, 1941 at Lake County, Ohio. Philip died on September 8, 1959, at age 45. 2. Mary Jane Cardina was born on June 26, 1918, at Painesville Township, Lake County, Ohio. She married Albert S. Halavacs, son of Alex Halavacs and Julia Reho, on November 29, 1941 at Lake County, Ohio. Mary died on Wednesday February 23, 1994 at age 75.